Use SignalFx to monitor Azure App Service via Microsoft Azure. Azure App Service: An overview of all the Azure apps being monitored by SignalFx. Users can also specify an app’s name to view metrics from a single app. Connections per App - A stacked chart of number of connections aggregated by app. Requests per App - A stacked chart of number of requests aggregated by app. Bytes Received - Total bytes received by all the apps being monitored. Bytes Sent - Total bytes sent by all the apps being monitored. Http 2xx Responses - Number of 2xx responses returned by apps aggregated by app. Http 4xx Responses - Number of 4xx responses returned by apps aggregated by app. Http 5xx Responses - Number of 5xx responses returned by apps aggregated by app. CPU Time (s) - CPU time of the monitored apps. Average Response Time (s) - Average response time for each of the apps. 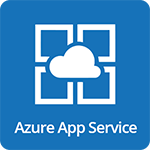 For more information about the metrics emitted by Azure App Service, visit here.